They've been planning to do it for 40 years, but this time they really mean it....? There was several times they really mean it. At least twice since 2003, three times with this last announcement. In province of Quebec, you can do up to ten electoral campaigns (knowing that a government mandate normally stands for four years) with a project like this one. And next general elections are set to upcoming October 1st. The James Bay Highway is 620 kilometres long and serves more than 11 thousand people, including several Cree communities, according to the Société de développement de la Baie James (SDBJ), which owns and maintains the road on behalf of the Quebec Transport Ministry and Hydro Quebec. The poor state of the road is the subject of much discussion on social media, where a Facebook page has been dedicated to road conditions and warning other travellers where the worst potholes are. Raymond Thibault, the chief executive officer of the SDBJ, admits the highway is in rough and even dangerous shape in some spots. He said crews have been out since the beginning of May doing temporary repairs with cold asphalt, but people should still drive carefully. While this time, here is a press release from the MTQ. Rivière-Rouge, May 25th, 2018 - The Quebec government confirms his commitment and makes a real move in redeveloping Route 117 with four lanes, between Labelle and Rivière-Rouge. In March 2018, the project was registered to 2018-2028 Quebec Infrastructure Plan, showing the will of the government to improve that route, especially about safety of travel. So the amounts required to drive all studies needed to determine the best long-term scenario are reserved in the provincial budget. The right-of-way, the number and the geometry of lanes, and the realisation schedule are some of the points to be analysed into the elaboration of an opportunity file. Since 2006, Route 117 is the subject of a structured intervention plan. Up to date, over 247 million$ were invested in traffic safety and flowing projects in the corridor connecting the Laurentians, Outaouais, and Abitibi-Témiscamingue regions. The redeveloping of Route 117 between Labelle and Rivière-Rouge is a major project estimated to over 100 million$. "The safety of road users is an essential issue and the improvement of Route 117 is a priority for our government. During the elaboration of this project, we will continue our collaboration with the SOS 117 Committee, in order to realise the right interventions at the right places." - André Fortin, minister of Transports, Sustainable mobility and Transport Electriffication. "Today, we confirm that the intention of the government is strong. The registration of the project to the Quebec Infrastructure Plan shows it. Here to the completion of this major project, it's essential to recall that several interventions will be made on Route 117, always in order to improve safety for all, as we do since several years." - Christine St-Pierre, minister of International relationship and Francophonie, and minister responsible of the Laurentians region. Route 117 is a major axis that is part of the strategic network dedicated to foreign trade. It is the only road connecting the Montreal motropolitan area and the Abitibi-Témiscamingue region. The road stretch targeted by the project, located between Labelle and Rivière-Rouge, bears two lanes on one carriageway (one lane per direction). Once the opportunity file has been completed, it will be submitted to the government authorities to determine the optimal long-term solution - 2020. Rebuilding of intersection with chemin du Parc Industriel in Rivière-Rouge. 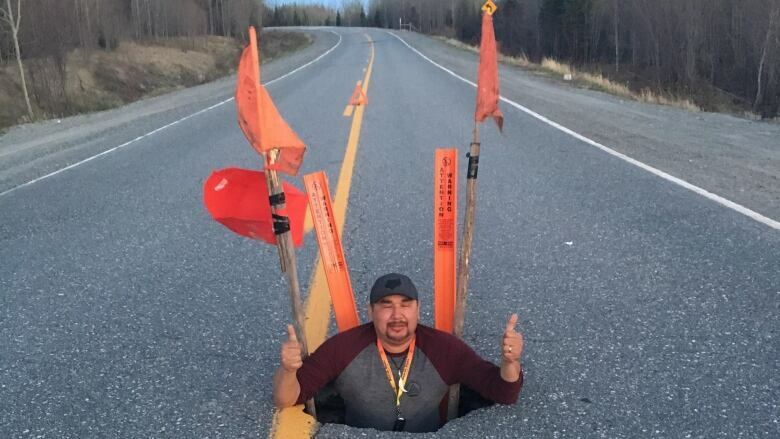 The Société de développement de la Baie James (SDBJ), which owns and maintains the James Bay Highway on behalf of the Quebec Transport Ministry and Hydro Quebec, says the sinkhole was caused by a corrugated metal culvert that failed. It was at the end of its lifespan. ... Culverts have a lifespan of 40 to 50 years, according to Thibault. The highway was built in the early 1970s to make way for hydroelectric development. About 330 culverts need replacing. Thibault said the culvert in question is to be replaced this summer as part of a $265-million repair project to close to half the surface of the highway between now and 2021. The work slated for this year includes $60 million to replace more than 60 culverts and repave more than 118 kilometres, including the section between kilometres 88 and 200. Eleven bridges will also be repaired and repaved, and guardrails replaced between kilometres 120 and 200. Quebec's Ministry of Transport is calling for bids to study the doubling of Highway 50 between Mirabel and Lachute, a roughly 20-kilometre stretch starting about 130 kilometres east of Ottawa. ... Between 15,000 and 21,000 vehicles use the highway between Lachute and Mirabel every day, according to the ministry. Highway 50, which connects the Ottawa-Gatineau region to Montreal, has been the scene of eight fatalities along undivided stretches since it opened in 2012. Has anyone clinched Route 138 (the central portion, not the disconnected segments.) from the NY border to Natashquan? What's the quality of the road and is it paved to the very end or is it gravel after a certain point? I did, but only up to Natashquan. The road is built and paved all the way to Kegashka now. The 40 km extension from Natashquan to Kegaska opened in 2013. My wife and I thoroughly enjoyed our road trip to La Malbaie in June. I *really* want to drive 138 out to its eastern end now. The only "hidden" route in Quebec is no more, markers have just appeared along Boulevard Champlain in Quebec City from Pont Pierre-Laporte to Côte Gilmour. Of course, soon there will be a second Route 136 as A-720 in Montreal is being downgraded to Route status. 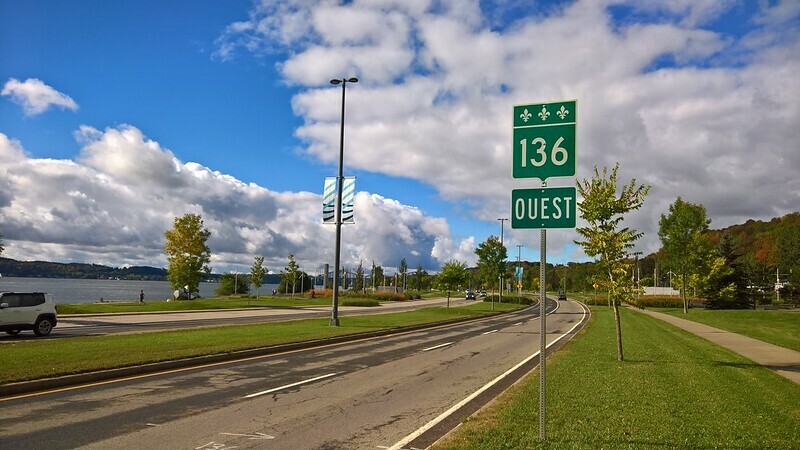 Perhaps the MTQ figured that they could order a few more signs while they were renumbering Autoroute Ville-Marie and finally signpost Boul. Champlain, after decades of neglect! They've been a little quiet about the A-720 downgrade as of late (at least in articles that made their way to the Facebook groups). I keep hoping that they'll come to their senses and pick another number, or even better, just leave A-720 be. I think the QC-136 designation, down from A-720, is just to please those environment-crazy groups. In fact, the only difference is that lanes will be about one foot narrower, so at a speed limit of 70 km/h (+/-42 mph), that will make no difference in traffic, because in daytime, it will still be jam-packed, and at night, well... nobody cares about speed limits anyway! One still has to wonder why they selected 136, and not something that was actually available. As an east-west highway, there was no available number in, or around the greater Montreal area. - 132: Used on South Shore of the St-Lawrence River. - 134: Used on Jacques-Cartier Bridge, and Taschereau Blvd. from Longueuil to Delson. - 136: Used in Quebec city, but not in Montreal. - 138: Used on Sherbrooke St., in Montreal, north of the QC-136/A-720. - 140: Not used, because there's a highway 40. - 142: Would be available, but wouldn't fit because the highway we want to number is between 134 and 138. Normally, highway numbers climbs from south to north (and from west to east); QC-132 is south of 134, that is south of 136, etc. They also keep numbers that finishes with a 0 - or with a 5 in case of north-south highways - as a continuity at the end of an Interstate-standard highway; QC-155 continues at the end of A-55, for example. But I say "normally" because the MTQ numbering system is full of exceptions. Interesting. I didn't know Québec had such a sophisticated numbering system. I probably would have went with QC 140, though - IMO grid violations are the lesser evil over duplicated numbers, especially since A-40 probably doesn't need a QC 140 to extend it (as QC 138 already does so). The fact that the St. Lawrence runs due north in that area certainly has interesting consequences for route numbering, since it seems Québec bends its grid to every bend in the river. Do the 2xx and 3xx routes have similar rules (beyond 2xx being south of the river and 3xx being north)? Yes. Moreover, routes 390-399 are reserved for Abitibi-Témiscamingue region, even though it's west of most 3xx routes. I would have opted for a new route 138 alignment. None of it is maintained by the MTQ east of Ville Saint-Pierre anyways. I do hope they will extend the new R-136 east over Rue Notre-Dame and Avenue Souligny. I do too. It could be a silver lining to losing A-720. I see on street view they added km markers to Avenue Souligny in the past couple years - could that be an indication that they will in fact do this? On the other hand, Avenue Souligny always had exit numbers for the A-25 interchange, so it might not be an indication of anything. That makes a lot of sense too. All it would need is an extension of the A-20 overlap and a short overlap with A-25. Yes, the idea is to create a comprehensive highway designation to replace the ill-fated Trans-Canada/A-20/A-720 project. The upgrade of Notre-Dame street between Dickson and Papineau is still in the plans. Wow, I thought that Toronto or Vancouver would spend more. Of course, the streets and highways in both cities are way better managed. You know the joke that was running about road spending in Montreal? It's the mayor of Montreal that have to meet three guys for a road project in the city. The first guy came in the mayor's office; he's from Toronto, and after looking at the plans, he makes a tender for 4 millions$. The mayor thanks the guy, and tell him the decision will be taken on next week. The second guy came in; he's from Calgary, and makes a tender for 3 millions$; the mayor thanks him, and gives him the same information. - I'll make the job for 5 millions$. - Wait... what? 5 millions$? - Yes, 5 millions$; one million for you, one for me, and we'll take the Calgary guy as a sub-contractor!"